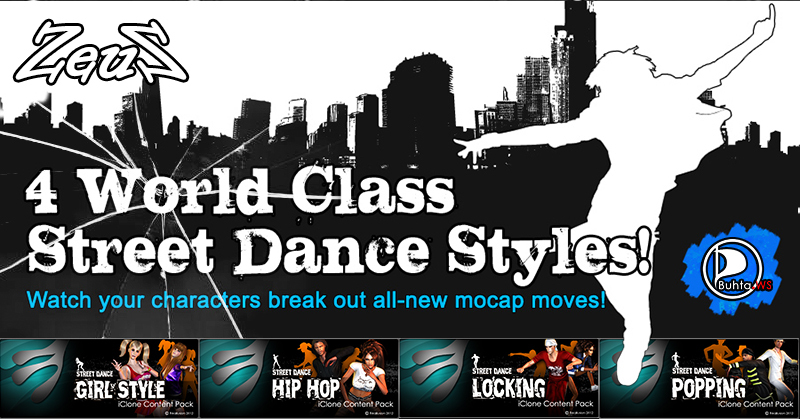 Street Dance Girl Style: The Girl Style motion pack contains Waacking, Voguing and New Jazz Styles that are integrated from modern house dance and a styles performed primarily to disco or funky music. You can see these styles in the videos of mainstream artists such as Madonna and Christina Aguilera. Street Dance Hip Hop: Hip Hop dance is one of the most universal styles in dance today, and has evolved over the years to incorporate a number of different styles to keep it one of the freshest dance genres out there! it is often freestyle in nature and hip-hop dance crews often engage in freestyle dance competitions. The motion pack includes lyrical Hip Hop routines and basic moves such as Body Waves, C Walk, Cat Daddy, Dougie, The Jerk, Up and Down and so on, which will allow you to mix-and-match movements with plenty of flexibility! Street Dance Locking: Locking means freezing from a fast movement and "locking" in a certain position, holding that position for a short while and then continuing in the same speed as before. The movements were originally danced to funk music and create large and are generally large and exaggerated, and often very rhythmic and tightly synced with the music. This pack will provide your dancers with the ability to do Brotherhood, Scoo B Doo, Skeeter Rabbit, Rock Steady and many more motions, and you can mix these up with a huge amount of flexibility! If you want to see some examples of Locking, have a look at Usher and Janet Jackson's moves! Street Dance Popping: Popping is one of the street dance styles that based on the quick muscle contraction techniques to blend into various poses and it’s often integrated with Robot, Waving and Tutting. All of the motions were captured from professional dancers using expertly choreographed dance moves. The motions can be combined in a variety of ways for maximum flexibility!